CoperWay-Bis-2TTX is a cost effective, new generation of SHDSL.Bis Extender and Ethernet distribution with a rich feature software. It embeds two G.SHDSL.Bis modems with TCP-PAM128 15 Mbps speed. Any Star, Bus / Multi-Drop and resilient Ring topologies can be designed. CopperWay-Bis-2TTX is made of a high performance Ethernet processor that performs wire speed and very low latency transmission. It delivers two Ethernet ports with QoS, VLAN, Traffic Shaping and also 802.1X authentication for best network security. A RS232 port connects to an asynchronous equipment (RTU) with application transparent Point to Multi-Point and Master - Slaves modem emulation. 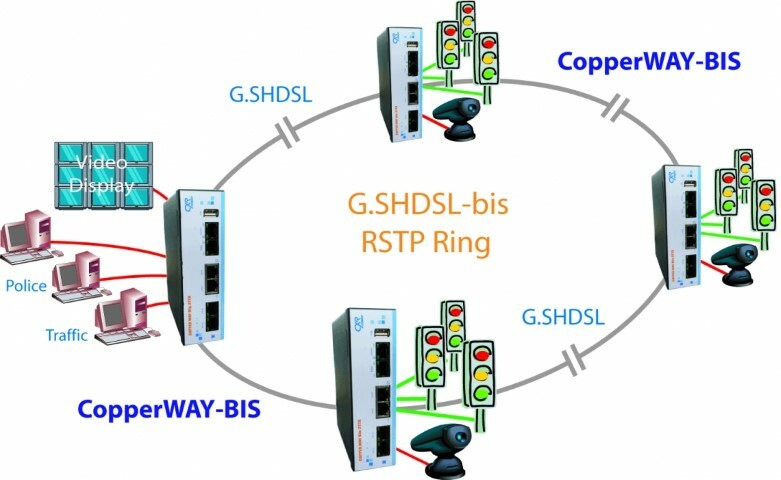 CopperWay-Bis-2TTX has two SHDSL.Bis interfaces,East and West directions to build a Bus or Ring daisy-chain network. The industry standard SHDLS.Bis, Ethernet First Mile modem can adapt itself to the copper line conditions to reach the best speed from 192 kbps to 15 Mbps. CopperWay-Bis-2TTX is highly manageable from the network. Its USB port provides automatic backup and update of configuration and software. It comes as a robust metallic DIN rail enclosure with dual 12/24 Vdc power inputs.